It is horrible when you are betrayed. It's like a monkey pretending to be a maid. Kyle gets upset. Munk is a threat. And the rest of the New Guardians want their beds made. True story. 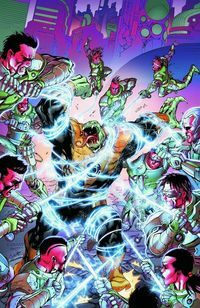 As told to me by Writer: Tony Bedard; Artist: Tyler Kirkham; and Publisher: DC Comics in May 2012. In this episode of the 'New Guardians', we see our motley crew of colourful wing-wearers in a right pickle. You see, Kyle did promise Invictus that he would kill Lafreeze in exchange their freedom. But no. Afraid not. Well, before Kyle and his gang can back out on this 'empty truth', and are high above sector 2829, they all start to run out of power. Oops! So what do they do? Spilt, of course. Muck is ushered back to the Indigo Tribe by Indigo-1. Kyle and Bleez have to go back to Earth for Rayners power battery. Fatality travels to Zamaron for her quick pick me up. And as for Arkillo? Ouch! Big problems ahead for him. OK, what I mean by 'problems', is that he meets up with the Weaponer on the planet Korgar prior to him having a very short-back-and-side's, where betrayal is relayed, and a solution presents itself. "A black hole was somehow transformed into the Gateway in which it emerged". I felt that this expression was slightly sexual coming from these blue-skinned beings, and I half expected Fatality to reply back to them by saying "Have you every thought about Internet dating?". I enjoyed seeing the Weaponer in this tale, because I did like his 'new take' prior to the DCnU kicking off. Moreover, that whole thing about how each of the different power-rings are recharged in different ways? A very original and compelling stand-point to tell a story from. Aesthetically this is a 'stop gap' type tale, which at first was a bit distracting because I would have liked to have seen how the 'New Guardians' dealt with Lafreeze. This is only a small gripe though. STORY: I know that this may sound strange, but I thought that the editorial team on this book, Sean and Pat, did a really great job of organising how the other stories in the other Green Lantern titles feed into this one. From reading most of these associated publications, I knew straight away where each of the players went off too, and why they had to go there in the first place. Synergistic to the max. ART: Bold, brash, and full of class, that his how I would describe Tyler Kirkham's art in this issue. Granted, it still looks a bit 'video-gamey' in places, though I do like how he draws Arkillo. Very monstrous indeed. WEAPONER: For this crafty craftsman, you need an actor who looks stoic, sounds like a rogue, plus can carry himself with an air of confidence. 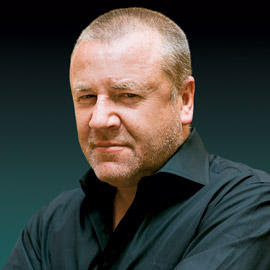 Ray Winstone of 'The Departed' fame. Hands down. ARKILLO: OK. So who is big in statue? Angry in demeanor? Animated in comportment? And looks like he could chop you in half with his tongue? Ricky Grover from 'Bulla'? Yes. Why not. Want To Save Money On Your Heating Bills? Why Don't You Kill Someone And Then Steal Their Power-Ring? Would it be ironic of me to suggest the rap anthem by Snap 'I've Got The Power' for this issue? Yes. Most probably. But I like irony. As well as Goldie and Silvery. Although this issue was conceptually a delay within the bigger story arc, I have to admit, I still kind of liked it. This title is growing on me by the issue, and I am warming up to the characters and the concept behind this title too. Fair dues, I don't feel that the concept of a 'gang of diverse lanterns' has been fleshed out properly as of yet. But given time this book may become a sleeper hit for DC.